I come in peace! That’s what the little traveling egg seems to say, I think. Crossing over a river of rice to get to the hotdog forests, I think he simply means to make friends. I might be mistaken that the little alien’s a she though, the little green antenna could be hair buns, you think? I felt the need for cute food. 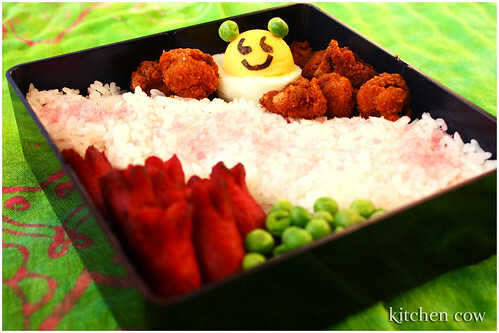 I miss seeing little smiles on my food so I decided to make the little outerspace themed bento. So for this meal, I made a little alien from a hardboiled egg, nori seaweed and green peas. He’s traveling along with some chicken popcorn asteroids. To get to the hotdog forest, (the one beside the green pea marshes) he has to cross a steamed rice ocean, that was liberally dusted with sakura denbu. Did I eat the ensuing cuteness? Of course I did. What’s the point if I don’t? He did accomplish his goal before ending up in my stomach, so it’s a small victory for him? She looks like Princess Leia! May kwento pa pala. Parang gusto ko ring tumawid papuntang… Hotdog Forest. Seriously, I love this bento. Siguro kasi sci-fi hehe. I am not going to eat that egg. Just looks so cute! harhar. Hehe, I have to learn to eat things with cute faces and stuff, otherwise, I’d starve! Hi kryjnn! Glad you’re starting bento too. It’s so much fun. Thankfully, I’m not as obsessed as I used to be because honestly, I used to buy boxes every week. Not a good thing, hahaha! About the peas, I broke off a tiny piece from a toothpick and used that to stick the peas to the egg. I’m not sure if it’s a good idea if a kid is eating it however, but for adults, I’m sure it’s all right as long as they know it’s there. It’s great to hear you’re blogging too! And I don’t mind you linking, I’ll drop by and visit in a day or two (and do something about linking back) —just too swamped right now.